Jun. 6, 2017 8:45 a.m.
Once a year the Kimberley Rotary Club hosts Lobsterfest at the Kimberley Conference and Athlete Training Centre. 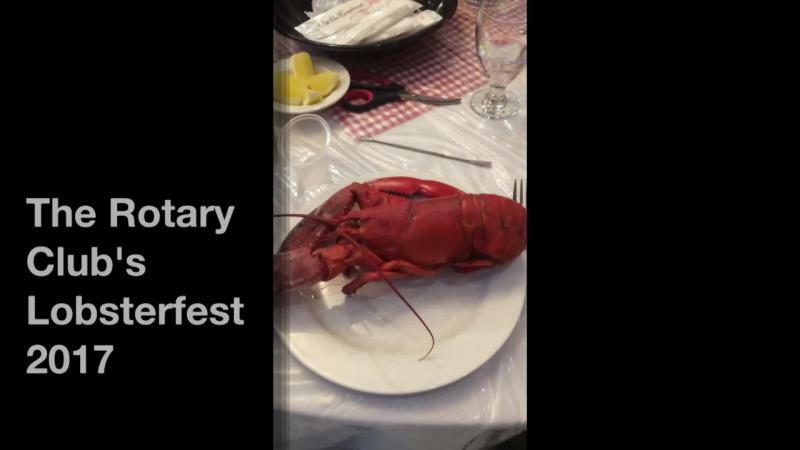 This year maked the eighth Lobsterfest event, with 190 guests, live entertainment, silent and live auctions, a 50/50 draw and much more. The evening started off at 5p.m. with cocktails, ticket sales, and live music by Clarence Uhll. At 6:15p.m. the salad buffet opened, serving coleslaw, corn salad, potatoes and fresh rolls. The buffet was accompanied by live music from SHEVA. Shortly after the buffet, was the traditional “March of the Lobsters”. McCormick says it’s the most interesting part of the evening. For anyone who didn’t know how to properly disassemble a lobster, there were videos and demonstrations playing on two large screens, making it less intimidating to dig in. The evening wrapped up with a dessert buffet, a live auction led by auctioneer Wes Tallman, and a silent auction with many donations from local businesses. Owners of the Tamarack Dispensaries, Tamara and Rod Duggan donated $5725 to the Rotary Club, which is equivalent to the total price for all of the lobsters purchased. Many of the sponsors and donors include Pacific Coastal Airlines, Fairmont Hot Springs, Go Kimberley, The Kimberley Bulletin, Canadian Tire, Kwick Print, Kootenay Granite, The College of the Rockies, Kimberley Riverside Campground, Tamarack Dispensaries, Kootenay Mountain Works, Kimberley Golf Club, St. Eugene Resort, Kimberley Dynamiters, The Sandman Inn, Wildstone Golf Course, Overwaitea Foods, Melody Motors, Trickle Creek Golf Resort, Mountain Spirit Resort, Canmore Wine Merchants, Creekside Physiotherapy, New Dawn Developments, Northstar Mountain Village Resort, Chalet GM, Wine Works and Shadow Mountain.